Posted October 24, 2011 by Sabine & filed under Acupuncture, Colds and Flu, Prevention. I don’t know about you but with the temperatures going down, I have seen more and more people coming up with a cold recently. Some people seem to get one cold after the other during the whole winter whilst others just sail through and never seem to be ill. So what can you do to be in that latest category of people? 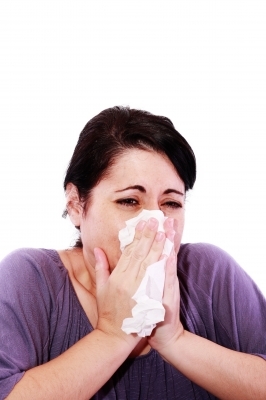 According to Chinese Medicine, a cold or flu is the invasion of a pathogenic factor. To avoid an invasion, you should avoid the pathogenic factors and have enough defensive energy to repel them. So what should you do? 1- Avoid getting cold. Having enough layers on, not going out with damp/wet hair, not going to bed with wet hair all help to prevent colds (There is some truth in our grand-mothers’ advice!). 2- Protect your kidneys. If there is one area that needs to stay covered, it’s the lower back. 3- Eat well cooked simple foods. So slow cooking dishes, soups, stews should be an important part of a strengthening diet. On the other side, raw and cold foods such as ice-cream, salads and other raw vegetables should be avoided. 4- Avoid dampness in your environment (such as a damp house but also like staying in a wet swimming costume) and in your diet. Dampening foods such as dairy products (except a little butter and yogurt), ice cream and foods full of sugar are all mucus forming and contribute to the apparition of colds. 5- Sleep well, at least 8 hours a night. It doesn’t sound like rocket science but you do need 7 to 8 hours of solid sleep every night. Going to bed before 11 o’clock also helps. And if you still get a cold? As soon as you feel the symptoms of the cold coming, you can try to drink a herbal tea made of fresh ginger (grated or sliced) and sliced onion. And if everything fails, take it easy. Rest is still the best medicine.